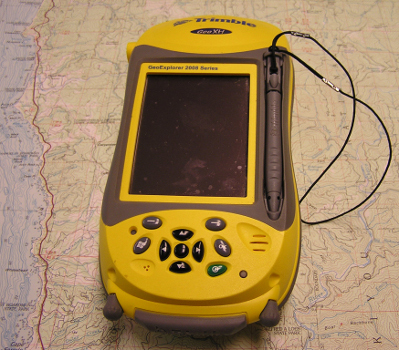 Submeter GPS running Terrasync, capable of accuracy to 0.1 meter under optimal conditions, using Zephyr external antenna (requires antenna cable) on GPS range pole and post-processing. For ~1m accuracy, use built-in antenna, or connect external antenna (with cable) mounted on GPS backpack. Also see field & lab exercises for Juno with Terrasync.